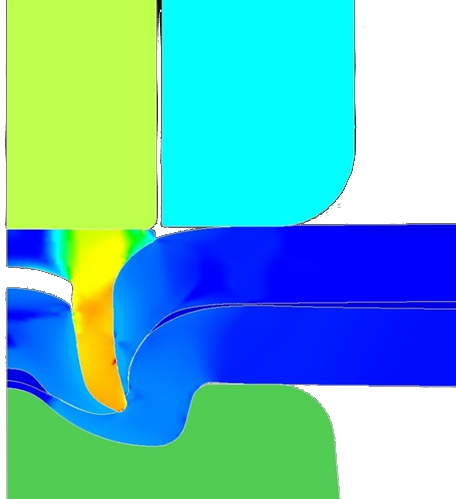 The simulation of thermal and mechanical joining procedures in automobile manufacturing answers critical questions during the production design process. Simufact’s solutions are the cornerstone of the virtual validation in car body construction. Simufact solutions for automobile production focus on car body construction (body in white). The trend towards lightweight construction and the material mix used therein, have led to the use of new joining processes. Simulating this is our business. Whether preforming spot-welding procedures, laser welding, mechanical joining, or soldering: virtual process design helps you find the potential benefits. We kindly ask you to provide us basic information on your needs in order to enable you with a quote. Address Mr. Mrs. Prof. Dr.
Ctrl + click Multiple selection possible. Please keep me informed about Simufact products and services. Joints have a significant impact on stiffness, energy absorption potential (crash-suitability), and the dimensional accuracy of car body panels. In mechanical and thermal joining, the importance of adhesive bonding (hybrid joining) is on the rise. The adhesive not only serves as a sealant and for corrosion protection, but it also creates a bond joint between thin components. 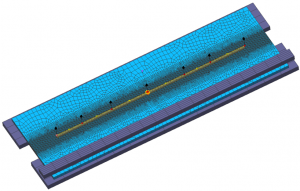 Simufact offers functions to consider adhesives in the joining process. In car body constructions, mechanical joining procedures are used to join components of differing materials. This applies to many connections with (and between) steel, aluminum, and fiber composites. Simufact supports simulation of these processes, including self-piercing riveting (SPR), blind riveting, flow-hole screwing and clinching. Self-piercing riveting involves the joining of sheet metal combinations by piercing a rivet through a component’s parts. The components interlock as the sheet on the punch side is deformed into the sheet on the die side, via a self-piercing rivet, producing a positive joint. The process requires access to the joining area from both sides. Blind riveting only requires you to have access to the joint from one side; however, the two components that are to be joined must be pre-punched. The blind rivet is spread apart on the blind side with a mandrel. This, in combination with the shape of the blind rivet’s head, creates a positive joint. This process is a self-piercing, self-tapping, screw joint which only requires access from one-side. Clinching (also known as pressure joining, press joining, and TOX-Clinching [TOX® PRESSOTECHNIK]) is a proven clinching method in which metal sheets are permanently joined without the use of any additional materials. This method is well-suited for joining metal sheets of differing thicknesses, as well as dissimilar materials with varying strengths. 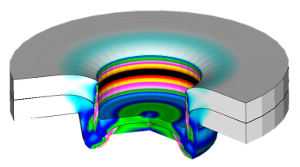 Read more about our Mechanical Joining Module in Simufact Forming. Thermal joining is still the most commonly used joining technique for similar metal-to-metal connections in car bodies, chassis, drivetrains, and exhaust systems. Welding and brazing techniques have a wide range of possible applications, which are usually achievable with low costs, high process robustness, and high joint strength. The procedure of laser beam welding involves a focused laser beam, serving as an energy source, directed towards a component via mirrors. At the point of contact, the laser melts the materials to form a bond. The advantages of laser welding are the high process speed, flexibility, and fine seams – which usually do not have to be reworked. Furthermore, laser welding opens up new possibilities within construction as it can be used for applications which are not easily accessible. Read a detailed description of the application module. Resistance spot welding is the most frequently used process for the joining of steel alloys. It requires you to have access from both sides and is well-suited for components exposed to view. Laser brazing is a procedure for the firm bonding of materials. A liquid phase is produced by melting or diffusing a solder, which has a lower melting point than the components being joined. Laser brazing only requires access from one side and is also well-suited for components exposed to view. Joined assemblies and finished vehicles face different challenges. There are a wide range of failures that fall under the category of feasibility: rivet penetration, resistance spot welding burns, or brazing gap formation. Furthermore, unfavorable process parameter can generate hidden failures. Example: KS2 tests for determining the resilience of joints against diverse kinds of stresses. In large-scale vehicle production, undesired process fluctuations frequently occur. In a worst case scenario, this will lead to the components requiring rework or being rejected during a quality audit. However, in the best case scenario, these fluctuations will already have been considered during the virtual process design. When designing self-piercing riveting processes, the material thickness combinations of the components can be factored in, resulting in high process reliability and minimal tool exchange. Simufact has developed a special solution to test and validate the variations within joining processes: The Joining Optimizer. The Joining Optimizer is a new add-on tool available for Simufact Forming – serving as an efficient solution in car body manufacturing. It shortens development times by automatic validation of self-piercing riveting and clinching processes. The user can virtually test a wide range of material thickness combinations with various rivet models and tool combinations. This evaluation delivers a ranking list of technically feasible die-rivet combinations for a single material-thickness combination. An easy-to-understand traffic light indicator based on undercut, minimum bottom sheet thickness, max. punch force, final rivet head position, etc. visualizes the feasibility. All evaluations are stored in a database for knowledge management, reducing the efforts for re-evaluation of similar material-thickness combinations. In a second, subsequent step, the Joining Optimizer Assembly helps optimizing the number of needed die-rivet combinations (best possible compromise) for a given set of material thickness combinations of an assembly – aiming at highest efficiency in serial production by minimizing the number of die and rivet changes. Simufact has developed the Joining Optimizer in cooperation with Audi, which is employing this solution in their productive environment. Thermal joining processes have the disadvantage of induced residual stresses which can distort the dimensional accuracy of an assembly. Furthermore, phase transformations can result in localized microstructure distortions leading to qualitative or functional failures. Simulation helps you to find these weaknesses early on and supports the identification of appropriate countermeasures. Taking the forming “history” of components into account is essential for the simulation of joining in order to increase the accuracy of crash and endurance tests. This helps to optimize the design of crash structures. A joining simulation that allows for an improved component design whilst taking into account the production sequence. Our practically tested software products make it possible for you to virtually evaluate the majority of joining processes and to optimize them via controllable process parameters. By using Simufact simulation solutions, the high number of physical tests can be reduced to a minimum. Virtual process testing helps you to avoid unforeseen effects and cost-intensive changes to the equipment. Using Simufact makes the development process more transparent allowing you to reach the desired quality and output quantity on time. Simufact can be used in both the development of technology and production planning. We even support the most experienced users with a customized menu navigation.